Extract Email Addresses from Clipboard. Take any text to clipboard, SEVAL will extract the Email addresses. 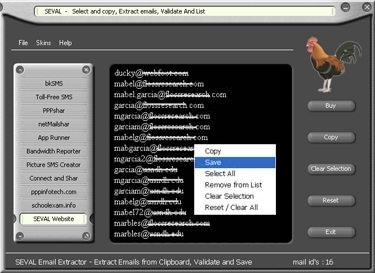 Use SEVAL Email Extractor & Validator to Select, Copy, Extract Emails, Validate And List. Collect and Storing emails while browsing Websites or reading documents or emails is made easy, if you use SEVAL. Simply select the text portion (Select Copy or Select All) in part or full which contains the email ids and copy the same. Ensure that SEVAL is running before doing this. SEVAL extracts, validates and lists after removing duplicates of all the contents in the Clipboard and now you can save or copy the email ids and use it for mailing or archiving. Email us if you have any special requirement to grab/filter/extract Email ids from any source. + Control web access with username/password. Only authorized users can use browser to browse websites. + Website blocker and filter. + Allow access only to list of websites you specify. + Allow/Deny browsing access to specific client computers. + Logging enables you to store browsing history of all users in your network in a single location. Copy text from any document to clipboard, SEVAL email extractor extracts emails from clipboard, validates, removes duplicates and lists them. Send (text) SMS from your PC without Internet or Cell Phone. Send, Receive SMS using GSM or 3G modem. SMS Merge, SMS from Excel, MS-SQL, MySQL, Oracle. Send SMS in any language (Unicode). Visit www.bksms.in to download free trial version.